March 13, 2019, 8:42 a.m.
By Julia Thomas March 13, 2019, 8:42 a.m. Some media had anticipated a period of partial censorship; Magamba Network, an organization supporting creative youth-driven projects in media and activism, ramped up its use of virtual private networks (VPNs) and distributed a toolkit prior to the information blackout on “how to survive an internet shutdown.” But for a few days, news cycles were paralyzed. Reporters for 263Chat and other news outlets were told to stay home, in part for their own safety. The crackdown, in response to civilians’ protests against a drastic hike in fuel prices, is the government’s most public attempt since its election last July to prevent news about state-sanctioned violence from circulating. Zimbabweans with VPNs could intermittently share photos and updates on the situation with hashtags such as #SwitchBackOnZW. But much of the country was without access to Facebook, WhatsApp, or mobile network service. The internet was turned back on when a High Court ruling declared the internet shutdown illegal six days after the first blackout began, but tensions continue to roil dialogues about media freedom in Zimbabwe. The crackdown on social media, in part, is a demonstration of how the WhatsApp corner of the internet has become a powerful space for Zimbabweans. WhatsApp facilitated the spread of misinformation during elections in Brazil and has contributed to caste-based violence and mob killings in India. But it can also serve as a platform for democratized distribution of news in a country with a storied history of oppressing government critics. Independent media in Zimbabwe are turning to WhatsApp as a primary distributor of news in the midst of an information landscape that is shifting to social platforms. State broadcasters and newspapers have long dominated the media, but alternative platforms began to exist and gain increasing traction in the last years of the Mugabe era. “WhatsApp has come in to fill the void that traditional/mainstream media was not able to fill, in terms of distributing alternative views on issues and policies,” said Sibongile Mpofu, a lecturer at Zimbabwe’s National University of Science and Technology. Zimbabwe, with a population of 16.7 million, has a mobile penetration rate of close to 100 percent, and an internet penetration rate of about 50 percent. WhatsApp connections comprise almost half of all Internet usage in the country. Mobile network operators such as the country’s largest, Econet Wireless, provide data bundles specific to WhatsApp and Twitter, or Facebook and Instagram, for as low as $0.50 or $1 per week, making it more affordable for people to freely communicate in an economy where a significant majority are unemployed. “When someone talks about internet access in Zimbabwe, they basically are talking about WhatsApp access,” said Thulani Thabango, a Ph.D candidate in media at Stellenbosch University in South Africa. The military supported the removal of Robert Mugabe, Zimbabwe’s leader of 37 years, from power in November 2017, which drove the initial surge in sharing news updates over WhatsApp. Nigel Mugamu, the founder of 263Chatv, says that he’s noticed a dramatic increase in activity, analysis, and conversation on WhatsApp since then. Each of the outlets that I spoke with is taking a unique approach to sharing news content on WhatsApp. But all believe there’s a need for instantaneous, quality news coverage — for both people who can’t afford to pay for data or other news media, and for those who want more nuanced analyses delivered directly to their phones. 263Chat began sending out a weekly e-paper via WhatsApp in November 2017, but quickly realized it wasn’t enough. So it launched a daily version that compiles content into a single PDF, which condenses the news into a smaller file and cannot be easily shifted or edited. The e-paper is consistently around 19 pages in length and uses 2.7 MB of data, down from its original 300 MB. Mugamu said the editorial team is focused on continuing to improve the way the e-paper presents content, especially after elections. The e-paper, which is sent out Monday through Friday around 6 or 7 p.m., includes original content in categories such as news, business, opinion, tech, and sports. Recent additions include a daily recipe and a classifieds section with job postings. The organization is trying to do more on-the-ground reporting in regions outside of urban areas, tapping into the community it’s created on WhatsApp for gauging interest on current stories and issues. 263Chat has seen an increase in advertising revenue and interest from large companies in the country, despite the economic issues that have plagued Zimbabwean businesses. Mugamu said in November that the company was on track to triple its revenue by the end of 2018. In an effort to reverse-engineer the process, 263Chat works with clients to develop an appropriate ad within their price range and designed for the platform of choice. While 263Chat is continually tweaking the e-paper and trying to make it better, Mugamu said it will always be free. Other alternative media outlets, such as the Center for Innovation and Technology (CITE) and Magamba Network, have begun to distribute broadcasts and formulate posts specifically for WhatsApp. CITE, which is based out of Bulawayo, the country’s second-largest urban province, launched its WhatsApp group, “CITE Content Distribution,” in May 2018. The group now has 157 participants. CITE founder Zenzele Ndebele and other journalists from the outlet share condensed versions of video interviews and articles posted from the site, and sometimes forward other content they come across. Magamba, the umbrella organization of the political satire show “The Week” and political news site OpenParly ZW, launched an elections “Twimbot” in July 2018. The coded system allowed users to find their candidates their constituency in Zimbabwe’s two largest urban provinces, Harare and Bulawayo. Many individuals joined the group, but shortly after its launch, the number connected to Magamba’s account stopped working and was blocked on WhatsApp. The team figured out that it had unintentionally violated a WhatsApp policy. Currently, the organization developing a post-elections bot to focus more on distributing content under the theme of “getting to know your MP” (member of parliament) and is testing a WhatsApp survey app to gather details for all the MPs. It’s also manually sending “The Week”‘s filmed skits to a broadcast list on WhatsApp with hundreds of subscribers. The recent internet shutdown has also pushed the outlet to think about expanding content distribution to SMS platforms, in the event of censorship in the future. Kukurigo Updates, a WhatsApp-based news platform, did this by sharing concise news updates in the month before elections in July 2018. It’s continued to publish editorials and videos about breaking news, political analysis, and sports in the six months since. People originally joined the broadcast list through an autoresponder, which sends out links for individuals to join. When users seemed engaged with the daily news updates, Kudzayi decided to make Kukurigo a full fledged news services outside of the elections season. As of November 2018, Kukurigo had about 13,600 subscribers in 56 groups. Now, Kudzayi says that’s grown to 28,000 subscribers in 116 groups. An average of six updates are shared each day in admin-only groups, in an effort to not overwhelm the channels with unrelated chatter. Recently, Kukurigo has started to group together multiple articles in one format to avoid sending too many messages, with sports and crime stories in one document. 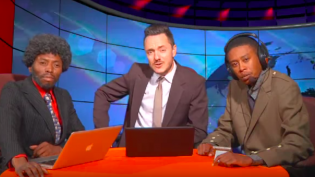 In a partnership with ZimEye, it also shares a daily “In the Press” medley of stories sourced by Voice of America’s Zimbabwe channel, Studio 7, in Shona and Ndebele, Zimbabwe’s primary vernacular languages. Kudzayi frequently writes editorials and sources analysis pieces from political stakeholders and from members of Kukurigo groups who get in touch with feedback. “We’re trying to get as many people as can read and understand as possible without cementing them in any way,” he said. Many of the videos Kukurigo shares come up in “random” social or interest groups on WhatsApp — and it’s not always clear where or from whom videos are coming. Follow-up reporting and an understanding of the video’s context are important. Kukurigo has initiated a practice of putting images first before its articles, and is experimenting with tags and italic and bold fonts on WhatsApp to format content. In the future, it may develop more beat-specific Kukurigo groups and even offer news subscriptions at a low cost. A roundtable news analysis podcast is also set to launch soon. WhatsApp is still primarily a social platform and these outlets are working through some of the structural issues that make running a full-fledged news thread challenging. One such problem is automation. The founders of these apps are all heavily involved with the daily sharing of updates to each active group on WhatsApp and are eager to begin using a terminal on top of the platform to share updates. They also have different ideas about the journalistic ethics of sharing forwarded messages. Mugamu said that he is eager for WhatsApp to introduce more tools for media outlets to convey that their content is verified and to create warning systems to dissuade people from sharing fake videos. “I’m hoping that WhatsApp is working on something that helps the end user know that this [content] is coming from a verified or reliable source. I worry a lot about forwards,” he said. Analytics are a challenge on WhatsApp, and particularly laborious for groups with thousands of members. 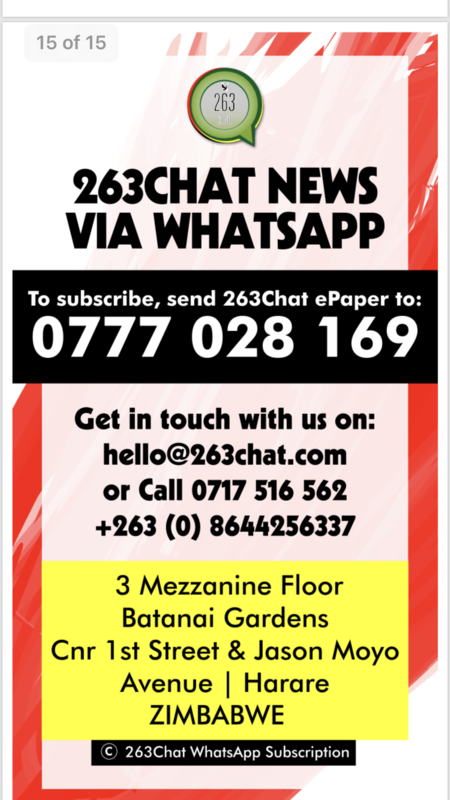 The 263Chat team discussed sharing a demographic survey link on Google Docs out on WhatsApp, but felt that it wouldn’t be representative of the e-paper’s audience because many of its regular readers don’t have data to access the internet outside of the app. Sharing updates on breaking news or making edits to published text is also difficult on WhatsApp. In one case, Kukurigo shared a short update on a detained journalist named Violet Gonda but a typo showed her name as “Violent.” Because the sharing of content is done manually, it is difficult to quickly retract errors and is generally a hands-on process of monitoring group membership. Dialogue on WhatsApp is also largely dominated by men. Though it’s challenging to track gender analytics in groups, most group chats consist primarily of male responders, as is the case in Zimbabwean media more broadly. No gendered WhatsApp channels yet exist, but several alternative outlets are turning more attention to stories which center women and seeking out female identifying reporters. Busi Bhebhe, the programs coordinator at the NUST American Space in Bulawayo and founder of gender-focused digital publication Amakhosikazi, said she sees WhatsApp as a platform worthy of exploration for news distribution. “No publisher seems interested in women or gender-focused coverage of news, this means a lot still remains in the dark and background of what is normally reported,” she said. So far, few alternative media groups are formally using WhatsApp — but even traditional media and long-time print newspapers are beginning to place ads on the platform, saying that they may launch their own channels. POSTED March 13, 2019, 8:42 a.m.
Thomas, Julia. "“WhatsApp has come in to fill the void”: In Zimbabwe, the future of news is messaging." Nieman Journalism Lab. Nieman Foundation for Journalism at Harvard, 13 Mar. 2019. Web. 24 Apr. 2019. Thomas, Julia. "“WhatsApp has come in to fill the void”: In Zimbabwe, the future of news is messaging." Nieman Journalism Lab. Last modified March 13, 2019. 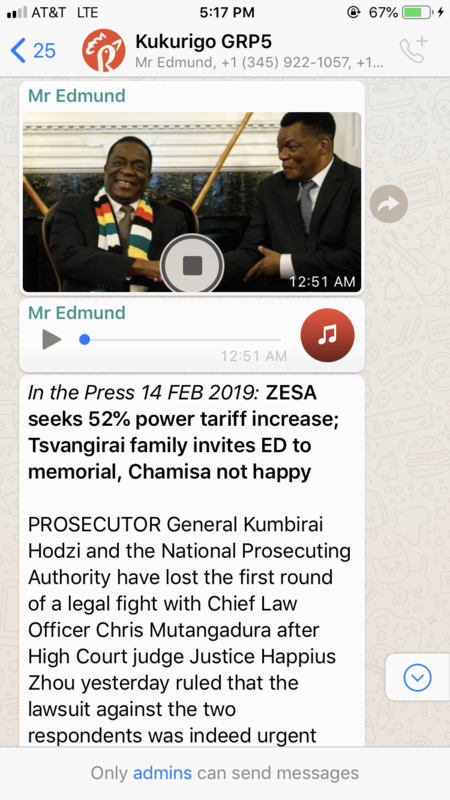 Accessed April 24, 2019. https://www.niemanlab.org/2019/03/whatsapp-has-come-in-to-fill-the-void-in-zimbabwe-the-future-of-news-is-messaging/.